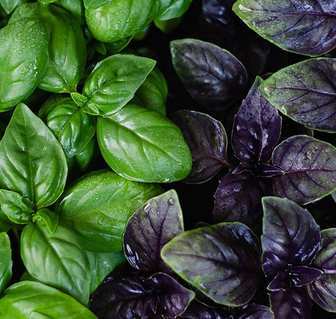 Distribution: homeland of a basil — The southern Asia, however in the run wild state it grows today in subtropics of Asia, America, Africa and in the Mediterranean. The main producers of this culture are France, Italy, Bulgaria, Hungary, Morocco and Egypt. Description of a plant: a basil — the annual grassy plant with a branchy stalk reaching in height of 90 cm. Leaves are thin, light green. Versions meet dark-violet leaves and stalks. Brushes are small, white, are collected by verticils in clustery top inflorescences. Use in cookery: in the course of drying of basilicas loses the most part of the aroma therefore it is the best of all to use this pryanoaromatichesky plant in a fresh bidet. Perfectly approaches as seasoning dishes from crude products, to salads, vegetables (mainly tomatoes and eggplants), to meat and fish dishes. Application in medicine: fresh leaves of a basil possess a lung успокаиваюгицм action and gyumogat at stomach pains and nausea. Aroma and taste: at a basil the sharp, reminding aroma of a carnation began to smell. On taste young leaves and escapes saltish and juicy.